The United States is in danger of becoming a welfare nation. The latest census bureau numbers from 2014 reveal a national disgrace: over 4.6 million “non-citizen” households are collecting some kind of welfare program — public housing, EBT, cash assistance, food stamps, Medicaid or the Earned Income Tax Credit. According to the census bureau, 63 percent of non-citizen households are abusing our welfare system. For those immigrants that have lived in America more than 10 years, the number goes up to 70 percent. In California, 72 percent — seven out of ten — non-citizen households use social assistance. And by “non-citizen” the census bureau means both illegal aliens and legal immigrants, such as green card holders and those on work visas. This is economically unsustainable. President Trump is right: open borders and massive immigration is costing the United States $250-$300 billion a year. If it’s not stopped, we are on the road to national bankruptcy and fiscal collapse. This is no longer Trump’s opinion. It is fact. Moreover, as a legal immigrant to this country (and a proud naturalized citizen) these numbers are not just shocking, but offensive. When I applied for a green card — never mind citizenship — I had to pledge that I wouldn’t be a burden to the state or collect any welfare assistance; rather, I had to promise that I had a job and was able to financially provide for myself and my family. Like previous immigrants before me, I came to America not to take but to be a taxpaying, productive member of society. I came to work hard, assimilate and achieve the American Dream — not to be a parasite or a drain on the system. These social welfare programs are intended for poor and needy U.S. citizens. They were not created to aid foreigners or lawbreakers, such as illegal aliens. These “non-citizens” are not only sponging off the system, abusing the generosity of Americans. They are engaging in outright thievery — taking money or government help that doesn’t belong to them. The biggest loophole these non-citizens are using is anchor babies. The census bureau reports that, although receiving welfare is largely illegal for non-citizens, by having U.S.-born children households are able to become eligible for government benefits. Why? Because U.S.-born children are automatic citizens, thereby entitling them (and by extension their parents and siblings) to the full range of social programs. It is a racket. And one that law-abiding, hard-working taxpayers are on the hook for. These are not the kind of immigrants America — or any society — needs. Yet, what did we expect? 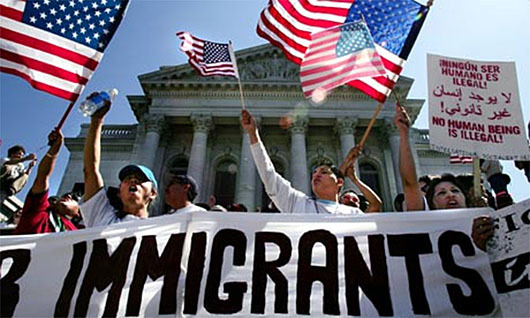 The United States is being invaded by Third World illegal immigration. Most of the illegal aliens are poor, low-skilled and low-educated. They speak Spanish (or other foreign languages) and know hardly any English. Once they enter, what are they to do — outside of taking menial jobs under the table, such as dishwashers, cooks or nannies — but get on the public dole? Otherwise, they couldn’t survive or take care of their families. And as the census bureau shows, the longer they stay the more dependent upon welfare they become. The traditional immigrants of the past — self-reliant, entrepreneurial, upwardly mobile — increasingly belong to a bygone era. Our ruling elites refuse to confront a seminal reality: not all immigrants — and not all waves of immigration — are the same. Hence, if Trump is serious about implementing his America First agenda, then he needs to do three things. And quickly. Impose a moratorium on all legal and illegal immigration. Demand that Congress pass a law prohibiting any legal non-citizen immigrants — including green card holders — or illegal aliens who have anchor babies from collecting any kind of government assistance. Should these parents object, citing the needs of their U.S.-born children, then they can go back to their home countries and get on welfare over there. It’s time we stopped our citizenship laws, especially the use of anchor babies, from being abused in order to subsidize lazy free-loaders and shameless grifters. Uncle Sam can no longer afford to be Uncle Sucker. After all, America belongs to us, its citizens. It doesn’t belong to the world.